Turning your idea into a product? We can help. First class equipment combined with generations of experience in fabrication gives you a distinct advantage. 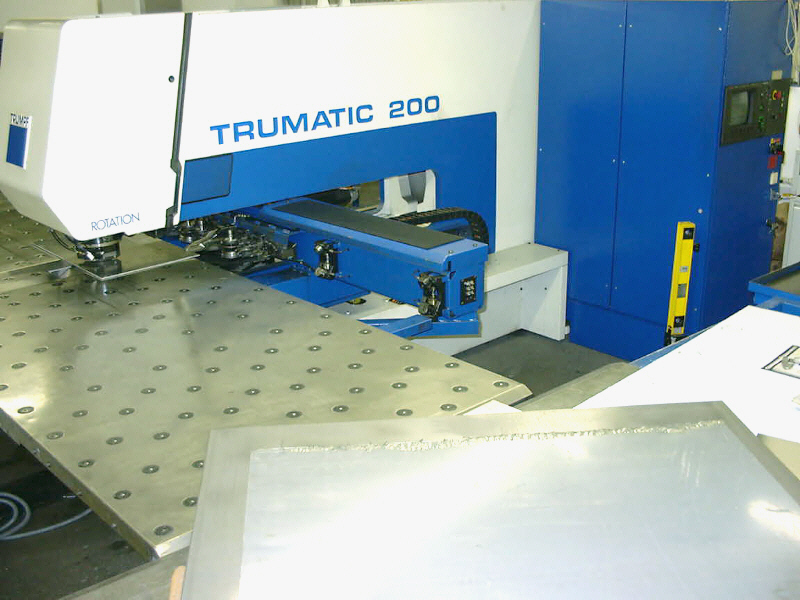 Full rotation tools on the Trumpf CNC Punches allow us to use materials in the most efficient manner. Not just for holes and cut outs, dimples, extrusions and louvers are also completed during the punching operation when possible. Our 30/40 Strippit is utilized for low-quantity prototype and an assortment of hinge and flat bar punching. Special features are accomplished using a variety machines. Typically counter bores, countersinks and threaded holes are completed in the Fab Shop while milled details are performed in our full service Machine Shop. Haeger precisions hydraulic presses are used to install PEM and Captive style hardware. We currently use two wet panel sanders for applying a grain finish to flat materials up to 36 inches wide. Small parts can be deburred in batches with our vibratory mill, giving the parts a cost effective random finish. Six and Eight Axis Press Brakes, using precision ground tooling, allow for accurate and repeatable formed parts. Steel, Aluminum, Stainless Steel, Cooper, Brass, Electro-Galvanize and certain Plastics, ABS and Lexan to name a few. We also offer our customers water jet and laser cutting, chemical etching, EDM services, painting, silkscreen, plating, anodize, alodine and hot dipped galvanized through our network of trusted vendors. Various other coatings and finishes are available. Please ask our sales team for assistance.